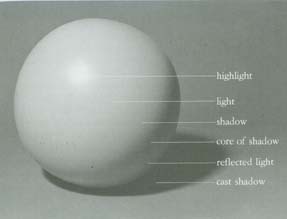 If you want to create the illusion of roundness in either painting or drawing, you need to study how light plays on a round object. Here’s the textbook analysis of a sphere being hit by light from the upper left and casting a shadow on the lover right. You can memorize this image and its labels and refer to it later when you draw as a kind of sacred scripture cast in stone. This really is IT. Now, as we all know, real life does not conform to holy writ and so it is with spherical objects, vases, bodies and drapery. 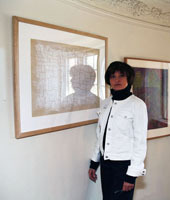 In real life, specifically still life, some objects are shiny and some are dull and therefore reflect light differently. This realization amounts to a kind of loss of innocence. The complexity of light reflections really does make you want to throw up your hands with the drawing pad landing behind the studio sink, but stay with it. Knowing the textbook case, as shown in the above illustration, will help you see what’s going on no matter how brazenly your object deviates from the norm. Consider the above page of studies. This is an 11 x 17 page that I scribbled while sitting next to students in my drawing class. #s 1 and 2 show round objects with the light coming from the upper right. Notice the reflected light on the left edge and then the core of the shadow a little to the right of that. 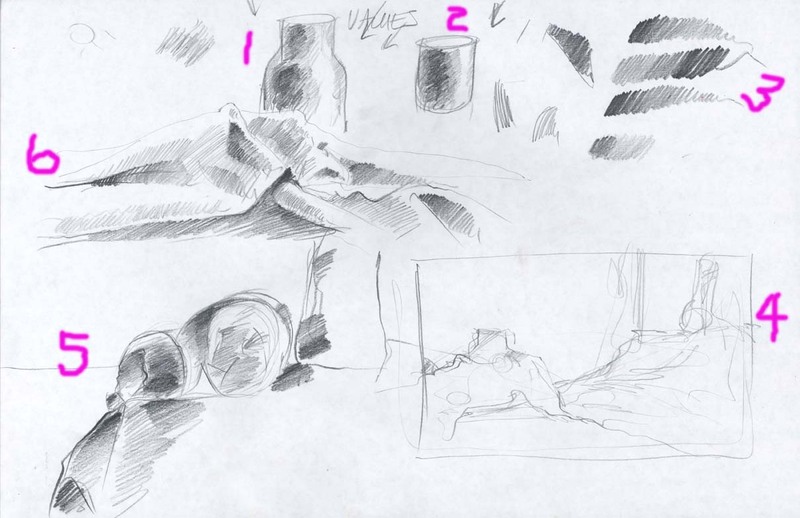 #4 shows the beginning of a still life drawing. The lines are faint, just to position the objects and the drapery on the page. With #5 we’re getting serious. We’re facing the drapery. Notice how rough this is, but notice also that the darks of the shadow are really dark. Nothing tentative here. This is important. After you have faintly indicated the main directions of the folds, go in for the kill. Find the courage to put down the darkest part of the shadows. Oh, no, you cry. Yes! Go for it. Seeing where the shadows are deepest will keep you from getting lost. In #6 we have a more developed chunk of drapery. It’s drawn with scratchy lines, nothing fussy here, no tromp-l’oeil blending. But doesn’t that look like drapery already….you can tell what’s happening, what’s catching the light, what’s tucked in, what’s deep in shadow. And notice the reflected light in that roll at the bottom. Without that, no illusion of roundness is going happen. It’s fun.